Q- Dr E, how do I know if I am lactose intolerant or not? I hear people say they think they are lactose intolerant quite often and they usually go to the extreme of cutting out all dairy products. I can definitely understand why that would be the first point of action for many, but it has always worried me because dairy products are our main form of calcium intake (as well as good protein and carbohydrate sources). Calcium is a very important part of our diet and it is hard for many to grasp how important it is until they are at an age (50 and over) where they are prone to an increase in bone fractures and other calcium related dis-orders associated with calcium restriction. Let me start by explaining to you what lactose actually does for us. Lactose is the main source of sugar from milk and milk products from all mammals except the sea lion. After ingestion, lactose passes into the small intestine where it comes into contact with lactase (a natural enzyme within our bodies) at the intestinal brush border where it is hydrolysed/converted into the monosaccharides glucose and galactose (sugars), which are easily absorbed. In-short, lactose is good for us because it can be converted to sugars by lactase which are then used by many bio-chemical processes in our systems. Remember sugars are not bad!, sugars are basically our human fuel or petrol, a car can’t run properly without a good supply of petrol and the same goes for our bodies. Over subscription to sugars is what is bad. Now that is out of the way. What do we mean when we say someone is lactose intolerant? And this is where it can get a little confusing. Time for the hard-core science section. Non-digested lactose can cause gastrointestinal symptoms such as diarrhoea and distending the intestines (bloating, cramps, abdominal discomfort) as well as psychological symptoms, events that are likely to lead to clinical symptoms. Lactose malabsorption refers to inefficient digestion of lactose due to reduced expression or impaired activity of the enzyme lactase. Lactose intolerance is when the gastrointestinal symptoms are clinically observed in an individual with lactose malabsorption. What causes lactose malabsorption I hear you ask? 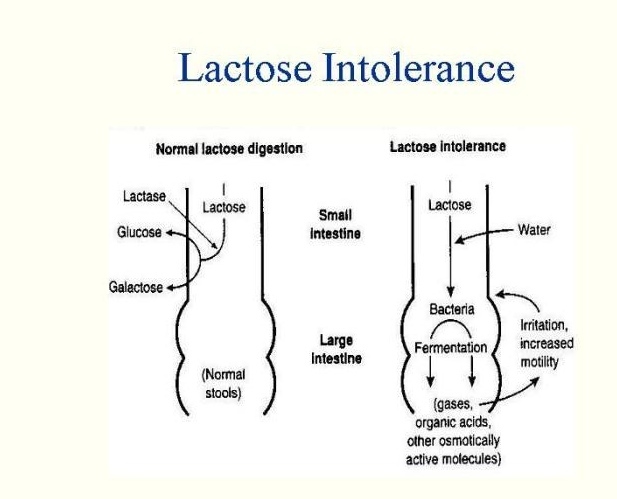 The most common cause of lactose malabsorption is lactase non-persistence also known as lactase deficiency, a common condition in which lactase expression decreases during infancy. What this means is that we naturally start off needing lactose as it is our earliest form of providing our systems with the sugars/energy it needs to grow and develop to adults. But, as we get older we don’t need it as much. I am about to really go in on this, hope you are ready? Lactase activity changes during development. In most humans, lactase activity reaches a maximum in late pregnancy but declines after 2–3 years of age and reaches a stable low level at age 5–10 (this is thought to be a process which might help weaning). However, a proportion of the human population, especially Caucasians from Northern Europe or Northern European descent, retain high lactase levels during adulthood. This is known as lactase persistence. 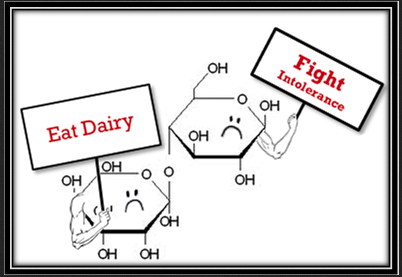 Just to be clear, lactase persistence means you and lactose can be good friends, if you want to. Therefore, lactase persistence and non-persistence are both “normal” human phenotypes. What is very interesting, is where lactase persistence is found and why? The prevalence of lactase persistence is high in most regions in Scandinavia, the British Islands, and Germany (80–95%); however, this condition is observed in only 20–40% of Indian adults, 30% of Mexicans, 30% of African Americans. Lactase persistence is thought to be related to the development of farming during the last 10,000 years. Just in-case you really really wanted to know, the genetic polymorphism responsible for most cases of lactase persistence in Caucasian individuals is the13910C/T variant (it’s all very straight-froward :-), T at position 13910 upstream of the lactase gene within a putative regulatory DNA-region causes persistence; C leads to non-persistence). Basically if you are from any of these regions you are good and if you are mixed, then you are also good because lactose malabsorption is a recessive condition meaning you need a homozygous genotype as a heterozygous/mixed geneotype is considered clinically negative. Statistical calculations of genetic data estimated that selection for lactase persistence commenced relatively recently, during the last 10,000 years. Lactase persistence was beneficial for our ancestors by providing a clean source of fluid and a source of protein, fat, and carbohydrates generating a selective advantage of 1.5–19% in each generation. This indicates a strong selection pressure comparable to malaria resistance genes (2–5% for G6PD deficiency, 5–18% for sickle-cell trait) in various parts of the world. That is a big deal by the way, selective advantages are hard to prove. So those rumours that humans are not supposed to drink milk, especially cows milk are questionable for two reasons, two very different reasons, in my humble opinion. Firstly, no significant bio-chemical difference between lactose in breast milk and cows milk has been observed, they both get digested in the same way via the lactase enzyme, which is common and present a birth. It is very rare that you are born lactose intolerant (known as congenital lactase deficiency). Secondly, cows milk has been reported to be ingested by humans from times dating back to the father of man, The Prophet Abraham according Biblical and Quranic scriptures and that tells me something, whether you are spiritual or not, history should at least strike a cord here? or maybe be not? As a scientist, I personally believe all evidence should be taken into account, including historical, religious, spiritual evidences. Saying all the above, I do appreciate that many people are experiencing discomfort when ingesting milk and dairy products. So what do you do if you are one of them? Treatment of lactose intolerance should not be aimed at reducing malabsorption but rather at improving digestive symptoms. Reduction of lactose intake rather than exclusion is recommended because long-term effects of lactose restriction may help improve gastrointestinal complaints but can lead to other damages. For example, the long-term effects of a diet free of dairy products may be a concern as you are significantly decreasing the amount of calcium. Low calcium levels are leading to an increase in fractures and orthopaedic problems. Adolescents require approximately 1300mg and over 50’s approximately 1200mg of calcium, which is roughly equal to 3 cups of milk per day. 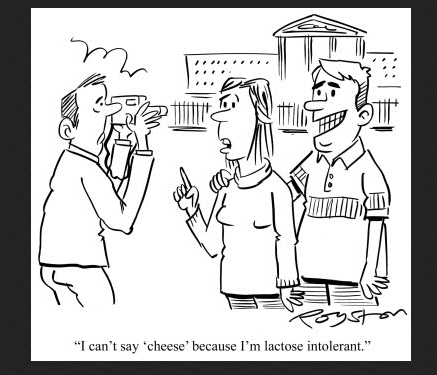 Furthermore, in blinded studies results indicate that most patients with self-reported lactose intolerance can ingest at least 12g lactose (equivalent to 250ml milk) without experiencing symptoms and taken with other foods, up to 18g lactose can often be tolerated (Suarez FL, Savaiano DA and Levitt MD, N Engl J Med1995; 333: 1–4). I know I took you all through the paces with this one, but I really wanted to flesh this one out. As with everything all food groups are important and good for you as long as it is taken with moderation, completely cutting out a good source of calcium because you think you may be lactose intolerant is not recommended. But, if you are then you should take all necessary steps to make sure you are providing your body with the healthy amount of nutrients it requires. Many lactose supplements and calcium supplements produced as “drugs” are available that can be taken to supplement your diet, but I hope you go the foodie route, it is much more colourful, fun and tastes all so wonderful. Hope you enjoyed the read and if the science was too “thick” for you ( ha, not sure why I like that word today, but like I do) click play and relax to this brilliant song by James Blake. This entry was posted in Knock Knock and tagged dairy, diet, dietry, food, geek, genetics, health, james blake, knock knock, lactose, milk, music, nerd, nutrition, retrograde, sceinceeducation, science by Faith In Geeks. Bookmark the permalink. Thanks E. My daughter is diary intolerant and it is a real concern for us. This is very informative and needed for us parents who want to know their options. You are most welcome Sonia. Let me know if you cannot access any papers or on-line articles you want to read and I will send them to you via e-mail. Great article and I love the comics! I have been asking my professors this question for a while and now I’m completing a presentation on the topic and your info will really help me out thanks!